Dutch Pancake (a.k.a "Puffy Pancake") — Hello, Sweetie! 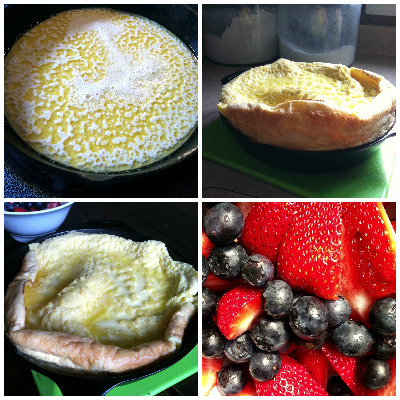 dutch oven pancake | hello, sweetie! Like most households, weekends for us are all about relaxing and finally coming together as a family. Saturdays are deemed "Donut Day". I pick up a few on my way home from working overnight at the sleep clinic. Most Sundays we try to do it up...eggs, toast, maybe candied bacon. More often than not it's pancakes. And not just any pancakes; a puffy pancake. One giant, soufflé-like work of art that's so impressive you'd think it were Mother's Day, but so simple you wouldn't consider making anything else. This is one of the first recipes I can remember making on my own as a kid. There are just a few ingredients and very little culinary technique involved. I was so pleased with myself when I saw it come out of the oven all puffed up. It's was only natural to have my own kids help me, and hopefully carry on the tradition with the same recipe my mother gave me. They love cracking the eggs, scooping and measuring the sugar and flour. Each takes a turn whisking until the batter is no longer lumpy. I take over anything having to do with the hot cast iron pan, but then it's just 20 minutes until goodness! Occasionally I'll leave the oven light on to watch their eyes widen in delight as the batter rises over the edges. We'll "ooh" and "aah" until it deflates, then load it up with fresh berries, warmed maple syrup and a dusting of powdered sugar. It has the texture of a quiche but the sweetness of pancakes. Even the baby loves it! And no matter how big the slice, they always ask for more! pancake before and after baking | hello, sweetie! Place the butter in a 10" cast iron pan and put into a cold oven. Turn the oven on and set to 400. (If using a stainless steel pan, preheat the oven to 400 and let the butter melt for 5 minutes.) Meanwhile, mix all the ingredients together in a bowl or a blender until no lumps are left. When the oven reaches 400, take the pan out (with oven mitts) and pour the batter into the melted butter. It should be just melted or slightly browned. If it has burned, don't waste the batter; just start over and melt more butter. Bake for 20 minutes. When you take it out, the edges will be big and puffy, but will soon deflate. (If by chance it didn't rise, try it anyway. It will probably still be good...unless you forgot an ingredient!) I usually cut into 4 slices but feel free to make them smaller, especially if serving with fruit or bacon and eggs. Dust with the confectioner's sugar.